Our beautiful cottage "Butje" is located 2 minutes walk from the harbor. Apartment "Butje 1" is upstairs and can be reached via a separate entrance. Straight ahead you can look out onto the dike from the large living room window, from the large balcony you can look directly onto the large lawn (in summer, 2-3 peaceful horses graze peacefully here). A large parking space for 3 cars is available, the front garden is happy to use. Until 1999 House "Butje" served as a working house for a fisherman of the village, in 2001 it was rebuilt to the present house of ours with much heart. In the cold months, a fireplace provides warmth and a nice atmosphere. For the "first fire" is always a basket with Anmach- and firewood available. For warm feet but also ensures that throughout the year on the floor heating in the bathroom and kitchen. 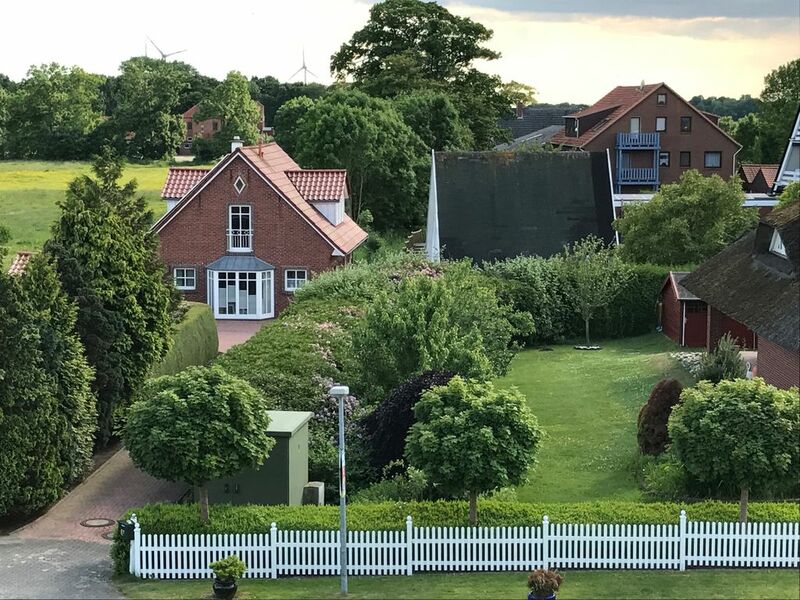 So that you can get an extensive picture of "Butje" we invite you to look at our numerous photos, also some impressions of the village can be found here. In addition to mudflats, trips with the Ausflusschiff Wega 2 ", museum visits, there are many opportunities for recreation and activities in Fedderwardersiel and the surrounding area, some information is available for you in the apartment. "Butje" is 65m2 large, has a cozy partially open kitchen and living area with fireplace, TV (Wi-Fi is available throughout the apartment). The extensively equipped kitchen comfortably seats 4 people at the dining table, and there is plenty of storage space. In the bathroom with shower cabin, the washing machine can be used. A linen package can be provided on request. The tourist tax is the only additional charge in our rental offer. We personally would take a vacation with us, should we have aroused your interest, then please contact us. Find out about the many opportunities to experience something in and around Fedderwardersiel under "Wadden Sea National Park Butjadingen" In 8km distance there is a center park, also Bremerhaven offers many things. (Museums, Cinema, Klimahaus, Emigration Museum, Zoo by the Sea, large historic and newer ports u.